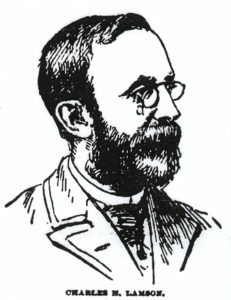 Charles H. Lamson, (1847-1930), of Portland, Maine, was a successful jeweler, watchmaker, bicycle dealer, and kite inventor. His kites were not toys, but large-scale, custom-built, flying apparatus that were capable of lifting a man into the air. He conducted experiments with his kites in the Portland area in the late 1890s, and achieved remarkable results. Other experiments with Mr. Lamson’s kites were conducted at the Blue Hills Observatory in Milton, Massachusetts. The following two newspaper articles relate to Mr. Lamson’s research. This article appeared in The Sun, (New York, N.Y.), on August 21, 1896. Leamson’s Kite Carried Up A Dummy Man 600 Feet. Portland, Me., Aug. 20 – Charles H. Lamson performed a feat here to-day practically demonstrating that a large airship or kite capable of carrying a man can be floated successfully and steadily. He raised his ship with a dummy man on it 600 feet. The retaining rope broke when the ship was at that altitude. Had it not been for this break Mr. Lamson would have sent up a man to navigate his ship. As it was, W. A. Eddy of Bayonne, N. J., an authority on aerial experiments, declared that Lamson’s achievement was the greatest step toward solving the problem of aerial navigation of the age. Two records, at all events, Lamson made. He flew the largest kite or airship ever floated. He carried by means of this kite the heaviest weight to the greatest altitude on record. The kite, when in the air, resembles two large oblong boxes parallel to each other and attached to each other in the middle. It took fifteen men to carry the kite or ship into the field from which it was to be sent up. The retaining cord was a large braided window cord tested to a pull of 500 pounds. This was made fast to a huge reel and four men attended to it. About 400 feet of the rope was run out along the ground, and at a signal from Mr. Lamson the ship was released. It quivered a moment and then steadily rose skyward. Seated on the car of the ship was a dummy weighted to 150 pounds. The ship carried it without any perceptible jar. It rose to an altitude of 600 feet, and was rising steadily when with a sudden gust of wind, snap went the rope, showing that tremendous pressure was brought upon it by the soaring of the ship. The ship floated out a half mile and descended as easily and gracefully as it went up. Had a man been in the car he would not have been harmed in the slightest. Mr. Lamson in the construction of this ship has followed some of Mr. Hargrave’s ideas. The point of similarity between the kite and Hargrave’s is in boxing the ends and making it double, that is, with two boxes or “cells,” as Hargrave calls them, with a space between. This style of kite has great stability when in the air, and when floating freely always settles gently, like a parachute. Mr. Lamson built his airship after Hargrave’s general plan, but added improvements of his own to make it more manageable in the enlarged form. In the first place, the rear cells were hinged on pivots near the center, so that their angle of inclination in reference to the wind and to one another can be changed at will. The passenger, by manipulating a lever, can keep the airship on an even keel, make it rise or fall, and direct its course in coming down. Lateral steering can be accomplished by changing the weight to the other side of the center, the aerial vessel then turning toward the side where the weight is greatest. Each pair of wings is like the wings of a bird. They are also ribbed fore and aft, and covered so that the stream of air can have its full lifting effect following the curve from front to rear, and preventing all shaking or flapping of the fabric. Mr. Lamson’s plan of jointing the aeroplanes or aerocurves makes it possible to attach the flying cord on a bowsprit. This makes it much easier to float the great kite than by Hargrave’s plan. 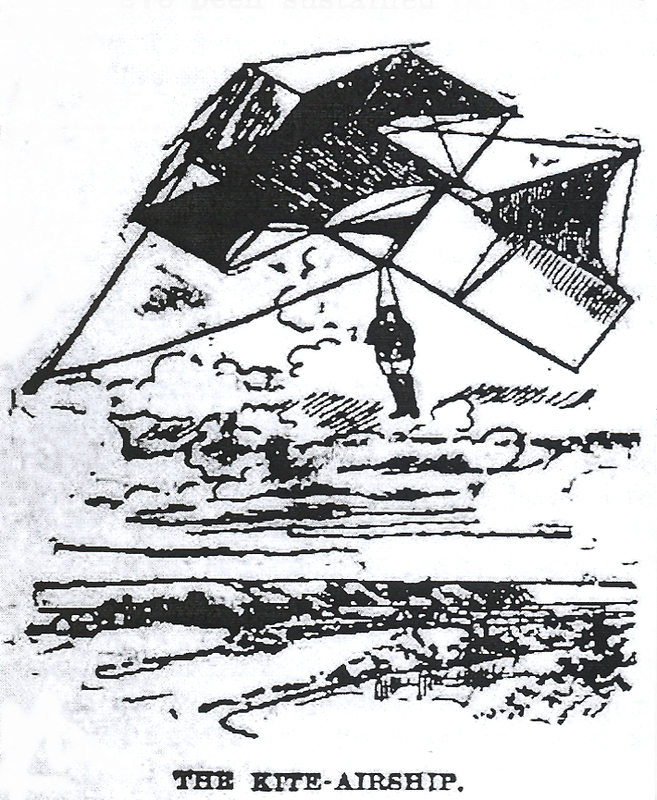 Mr. Clayton of Blue Hill Observatory estimated that the kite would pull at least 800 pounds if it were hung as Hargrave advises, but by Mr. Lamson’s arrangement the strain on the cord is greatly reduced, so that a few men can handle it in ordinary winds. A heavy windlass loaded with sand bags held the 2,000 feet of cord to-day. All that was necessary to launch the airship was to raise its forward end a little and take a short run, when it sailed up into the air like a balloon. The ship presented a novel and beautiful appearance as it soared gracefully above the heads of 1,500 people, who stood gazing with open mouths at this strange monster of the air. Nobody, to see the kite on the ground, would ever imagine that it would fly in mid-air, but Lamson demonstrated the fact that it would. Mr. Eddy and other authorities said that to-day’s performance exceeded anything that Lilienthal or any former leader in this work has done. This next article appeared one year later in the Waterbury Democrat, (Waterbury, CT.), on August 11, 1897. Wind is the Motive Power – He remained Poised in Air at Will and Might Ascend to Any Height He Pleased – He cannot However, Descend at Will. 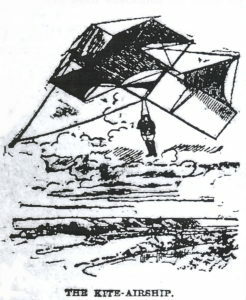 Charles H. Lamson of Portland, Me., has demonstrated to the world that he has invented a kite-airship which is capable of raising a man from the ground to almost any height and sustaining him in the air. the weak point in his invention is that while he can raise himself with his kite at will, he cannot lower himself. But this defect he hopes soon to remedy. The demonstration of his kite’s powers was made in the presence of a number of well-known scientists who have taken much interest in the study of aerial navigation, and they all agree that the results Mr. Lamson has attained are of great interest and value. They look upon Mr. Lamson’s achievement as a distinct step forward towards the accomplishment of practical aerial navigation. Exactly what this last laborer in the field of aeronautics has done is to prove that it is possible for a man to ascend in the air on a kite, taking his seat while the kite remains stationary on the ground and then rising easily and safely with it on its upward flight. Men have been sustained on kites before, but in all previous cases the kite has first been sent up into the air and the rider afterwards hauled up to it by means of pulleys and ropes. Mr. Lamson’s kite sails away with its passenger, and if he could make come down when he wanted to, aerial flight would be, at least, a partial success. The kite weighs about 100 pounds, and its rider sits in a boat-shaped car, which is suspended from between the two sets of box kites. Attached to the bottom of this car are two bicycle wheels, by means of which the kite can be moved along the ground without danger of breaking the structure. The axils are so placed that when the supporting surfaces are folded down the kite may be moved about by one man. Mr. Lamson has made two ascensions, rising each time to about fifty feet from the ground and remaining poised in the air for fully half an hour each time. He intends to add to his kite a feature which will make it possible for the rider in the car to raise and lower it at will so that it will either ascend or descend at his pleasure. He will do this by passing a cord around the bowsprit of the machine and attaching one end of it to the forward sail, while the other end passes through the pulley in the guiding line and back into the rider’s hands. 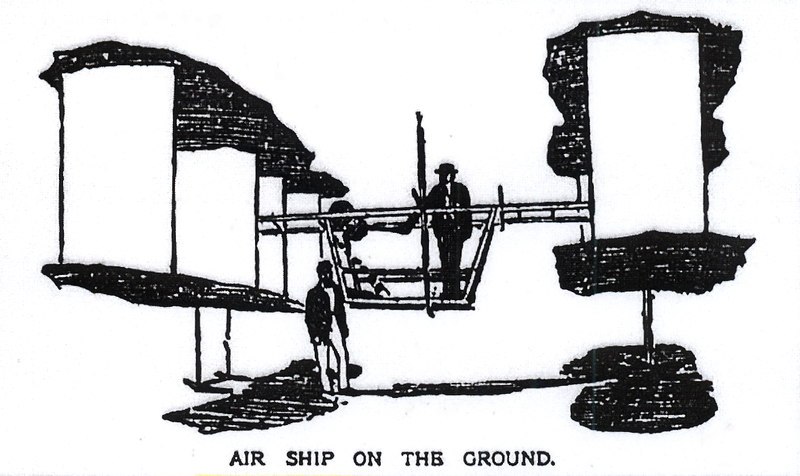 Mr. Lamson refuses to say just what he thinks may be developed from this airship-kite of his, but he believes it will be possible for a man to ascend to almost any height in the air and remain there as long as he wishes and then descend to the ground in safety by pulling the cord, which will be attached to the forward sail. Last year Congress appropriated a certain sum of money to be expended in experiments with kites by the Blue Hill (Mass.) Meteorological Station and at this point , the kites furnished by Mr. Lamson are being used. They are sent up into the clouds a thousand feet or more above the earth, and have instruments attached to them for recording temperature and the direction of air currents and other interesting data.